all cultures the songs that they bring to the circle. Everybody is welcome. is cultivating this original bond and will present songs from various traditional cultures in a beautiful and intimate setting. „Tavis upleba – Freedom to be yourself” – A Georgian-German Choir-Project directed by Imke McMurtrie and Tamar Buadze. 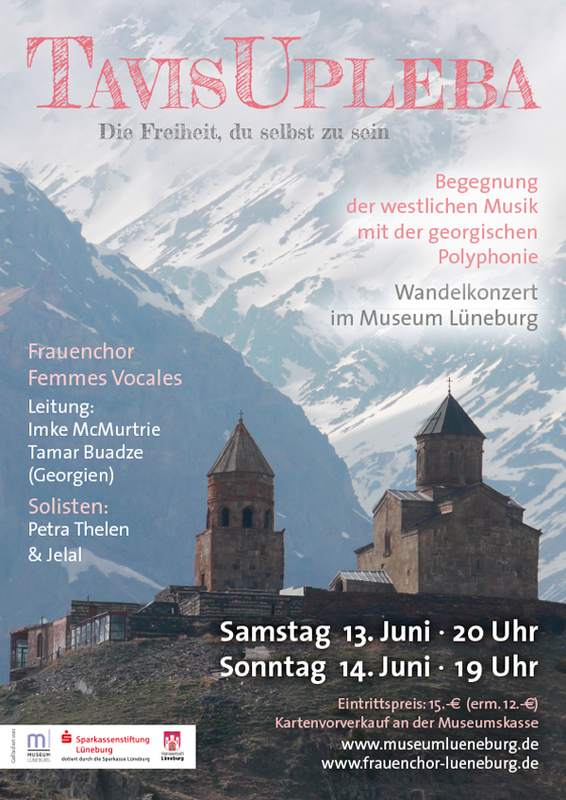 Music ethnologists and singers from nine countries of Western Europe will exchange songs of their own traditions with the Georgian women’s choir Tutarchela. In exchange the Georgian singers will teach songs from their own polyphonic tradition. The project will culminate in final concerts in Georgia and possibly also in the countries of the other participants. The project is supported by the patronage of the Embassies and Cultural Institutes of the participating countries. Rehearsals and concerts will take place in May 2013 in Tbilissi/Georgia. For this project we are still looking for sponsorship: please contact us. 2011: The women’s choir Femmes Vocales initiated this project to create international mutual understanding between Georgia and Germany through sharing traditional polyphonic songs. This project was supported by the patronage of the German Embassy in Tbilissi and the major of the City of Lueneburg. The objective was to build a bridge between two musical traditions and to enable an inspiring exchange of two very different approaches and methods of singing. The embracing of the foreign, and appreciation of one’s own singing culture is a unique and practical way to international mutual understanding. Singing together has always been an excellent way to bring people together, which has unfortunately become forgotten in the face of an increasingly passive consumption of music. 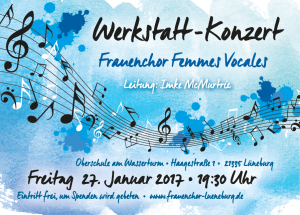 This musical exchange between Georgian and German women has also given the participants an insight into the different day-to-day realities of life for the women of each country. 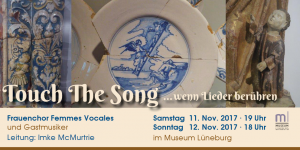 for music-ethnological exchange and concerts to experience and research the healing capacity of ethnic singing. Both singers, Germana and Imke have been studying with indigenious people and singers from many different countries to explore the significance that ethnic singing can have for us all. The sharing and transmission of the songs from different traditions is done with an attitude of utmost gratitude and respect towards the people and the culture from which they stem. It is a reverence for the Oneness of all traditions and for the experience that brought these songs to life. For people have often survived traumatic experiences, political oppression, social destruction, economic disaster, inner and outer hostility, crisis of identity and spiritual decay with the help of their singing. One can almost say that the power of song is especially appreciated and vivid in cultures where there is great suffering. Maybe singing together and listening to each other comes easier when there is nothing else to hold on to or to pretend. 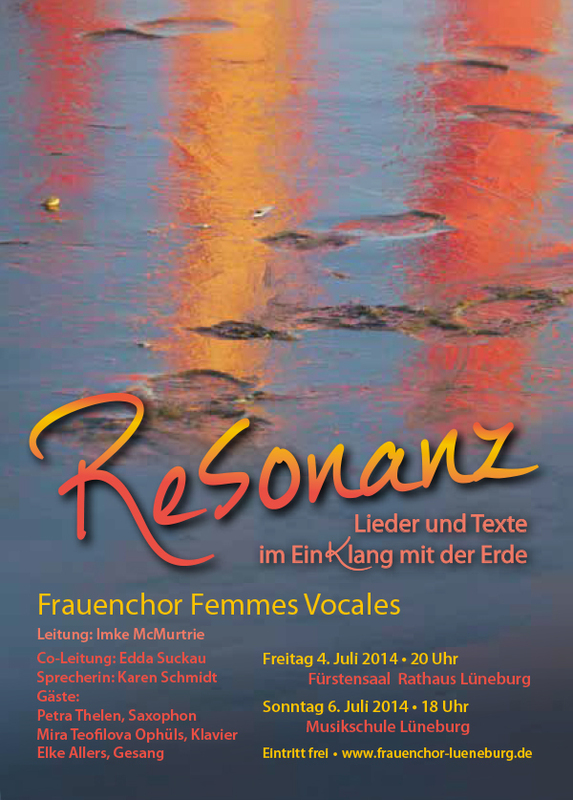 in Lueneburg, North-Germany since 2004, conductor Imke McMurtrie. The women of the choir don’t sing to achieve perfection, but to experience and pass on the joy of song and its intercultural, social, curative/healing and harmonising effect.